What is the first thing you should do when you sit down to write a business plan? Well, if you want to emulate the strategies of successful business plans that engage readers and get them excited, then center your efforts on arousing your readers' feelings. 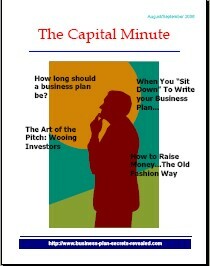 When you write a business plan don't worry about how long it is. As you'll see in this issue, the length of your business plan has little to do with its success. That's why you'll want to read: How Long Should A Business Plan Be? I promise, you won't need to worry about the length of your plan again. Instead, when you write a business plan, ponder the viewpoint from which you write your plan. That means learning how to see the person you are writing and using the methods effective writers use to get yourself in the mood for writing. All this is what's covered in our feature article, When You "Sit Down" to Write Your Business Plan. Now, you know that writing isn't the only way to communicate your plan. You need to be able talk about your plan. And, that's just what fifty entrepreneurs had do when given just six minutes to win over deep-pocket investors in The Art of the Pitch: Wooing Investors. Read this short article to avoid the ultimate "pitch" disaster. Finally, while the rules governing money raising activities are much more restrictive today, much can be learned from the methods and styles used back in the "old" days. Join me as I take a step back into the past in How to Raise Money...The Old Fashion Way. The tips you pick up here may just change your future.